I'm sitting down to fill out a bunch of MIR I had pending and just wanted to remind everyone about 2 GREAT P&G rebates. The second rebate is for Olay products. Get $15 MIR WYB any 3 Olay Facial Moisturizers, Facial Treatments, Facial Cleansers, Hand & Body Lotions, Body Washes or 6+ Bar Soap Pck. All purchases must be made by 3/12 and your forms must be postmarked by 3/26. Click HERE for the MIR. 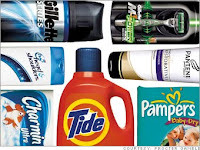 I am using all the swiffer, febreze and Mr. Clean products I bought last week at Wags for the $50 P&G Rebate and the FREE Olay WYB Venus either at Wags or Target for the Olay rebate.